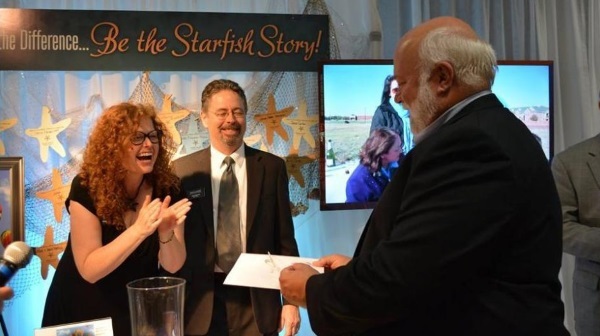 Diamond Insurance Group, Inc. is a proud sponsor of The Starfish Benefit, which is hosted by the Child & Family Guidance Center of Texoma. The eighth annual event is set to take place on Saturday, September 7, 2019. We hope to see you there! “The needs of our community are pressed into us for so many reasons. Every day the large parking lot next door at the Child and Family Guidance Center of Texoma is full of their clients who come with hurting, grieving children and broken families trying to cope with grief and violence, learn to change family systems, heal. Even after all these years our hearts ache with the crying and celebrate with the laughter. In 2017, CFGC’s clinical team delivered over 10,000 hours of mental healthcare services to 3000 children, parents/caregivers and family members. Still it is estimated 3 out of 4 children with mental healthcare needs do not get the help they need. CFGC is dedicated to removing the most challenging barriers to mental healthcare access caused by poverty and trauma. With Nationwide’s support, we help raise funds every year which provide healing sessions for families regardless of their ability to pay. Sherman, TX — Helping community members protect their future is more than just a job for Stacy Rake, it’s a way of life. That steadfast commitment to community service coupled with outstanding agency performance has earned Rake Nationwide’s select either Southwestern Regional Community Service Award or Nationwide’s Corporate Community Service Award. A Nationwide agent for nearly 20 years, Stacy Rake has dedicated her career to counseling customers on their insurance and financial services needs, providing them with security for the people and things they value most – their loved ones, their homes and their businesses. Stacy Rake commits much of her time to a number of organizations around the community including The Child and Family Guidance Center of Texoma. The Center will receive a $1,000 donation from Nationwide. Stacy will also be featured on a Wall of Fame in the Nationwide corporate office in Columbus, Ohio. The Champion Award is for outstanding achievement in sales of multiple products, including automobile and homeowner’s products, business insurance and farm and ranch protection as well as life insurance and other financial services products. Stacy Rake consistently drives results and represents the true nature of Nationwide's most elite performers. She puts the customer at the heart of the business, challenging herself and those around her to deliver the On Your Side® personalized customer experience each and every day. Stacy Rake is principal agent of the Diamond Insurance Group she has an office in the Sherman, TX area, located at 808 E. Pecan Grove Rd. This is the third year she has qualified for the company’s annual community service award. Nationwide, a Fortune 100 company based in Columbus, Ohio, is one of the largest and strongest diversified insurance and financial services organizations in the U.S. and is rated A+ by both A.M. Best and Standard & Poor’s. The company provides a full range of insurance and financial services, including auto, commercial, homeowners and life insurance; public and private sector retirement plans, annuities and mutual funds; banking and mortgages; specialty health; pet, motorcycle, boat and farm insurance. For more information, visit www.nationwide.com. Nationwide, Nationwide is on your side, Join the Nation and the Nationwide N and Eagle are service marks of Nationwide Mutual Insurance Company.